Join us for this fun NEW late summer workshop! 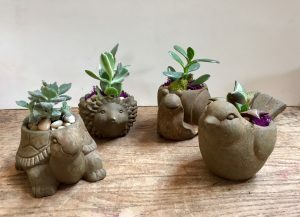 Place a mini plant in your choice of a cute animal planter – hedgehog, turtle, snail or bird. Add moss and stones to finish off your design. Both kids and adults are welcome. Great “Mommy and me” activity before the kids go back to school! Cost is $20 per planter.